Buy Me Gifts Blog | Wishlist Ideas: How To Create A Wishlist? Wishlist Ideas: How To Create A Wishlist? Just building a Wishlist of products is great. You will get gifts of your choice too. Sharing it with the world is another awesome thing. 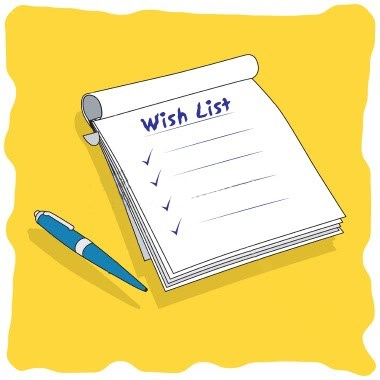 But do you get a question in your mind, “How exactly to go about building a wishlist?”. If yes, this post is for you. And if not, these few pointers will still help you get better at it. To begin building the wishlist is just not easy. You feel like adding everything you ever wanted into the wishlist. And then you feel that it’s costly and no-one will gift you that. Or you feel that you have added things that you don’t really want but are likely to get. Believe us, it’s not easy to build a wishlist. Let alone doing it at a stretch. So, the first pointer for everyone is to take time to build a wishlist. There is no hurry and I am sure you know that the Tortoise wins! Make sure you don’t miss anything that you really like by taking a pic of that product and uploading it to Buy Me Gifts ASAP. Make sure you always keep your wishlist updated. Everyday is a chance to get gifts from your friends and family, never miss it! Don’t ever, we mean EVER forget to share your Wishlist once you have updated it. Let the world know and you shall receive your gifts. Wishlist is like Knowledge. The more you share, the more gifts you receive. Share this post to let the world know the tips. And if you have any ideas about creating a wishlist, do not hesitate to share them in the comments section below. Wishlist: What’s all the fuss about?